Researchers have discovered that a genetically engineered Newcastle disease virus, which harms chickens but not humans, kills prostate cancer cells of all kinds, including hormone-resistant cancer cells. The work of Dr. Elankumaran Subbiah, an associate professor of virology in the Department of Biomedical Sciences and Pathobiology at Virginia Tech, along with Dr. Siba Samal, associate dean and chairman of the University of Maryland's Department of Veterinary Medicine, and Shobana Raghunath, a graduate student in Subbiah's laboratory, appears in the April 2013 issue of the Journal of Virology. "This potential treatment is available for immediate pre-clinical and clinical trials, but these are typically not done at the university level," Subbiah said. "We are looking for commercial entities that are interested in licensing the technology for human clinical trials and treatment. Newcastle disease virus has yet to be tested as a treatment for prostate cancer in patients." Newcastle disease virus affects domestic and wild bird species, especially chickens, and is one of the most economically important viruses to the poultry industry. Dr. Elankumaran Subbiah, an associate professor of virology, has studied the cancer-fighting properties in Newcastle disease virus. Although it can cause mild conjunctivitis and flu-like symptoms in humans who have been in close contact with infected birds, it does not pose a threat to human health. "We modified the virus so that it replicates only in the presence of an active prostate-specific antigen and, therefore, is highly specific to prostate cancer. We also tested its efficacy in a tumor model in vitro," Subbiah said. "The recombinant virus efficiently and specifically killed prostate cancer cells, while sparing normal human cells in the laboratory, but it would take time for this to move from the discovery phase to a treatment for prostate cancer patients." Earlier human clinical trials for other types of cancer with naturally occurring strains of Newcastle disease virus required several injections of the virus in large quantities for success. Subbiah believes that the recombinant virus would be able to eradicate prostate cancer in much lower doses. It would also seek out metastatic prostate cancer cells and remove them. Because it is cancer cell-type specific, "the recombinant virus will be extremely safe and can be injected intravenously or directly into the tumor," Subbiah added. Subbiah received a $113,000 concept award from the U.S. Department of Defense to develop his prostate cancer treatment under a Congressionally directed medical research program. He is seeking additional foundation and corporate funds to take his research to the next level. The researchers have also received a National Institutes of Health exploratory grant to develop the cell type-specific Newcastle disease virus for several other types of cancer cells, including breast, pancreas, brain, prostate, and multiple myeloma. 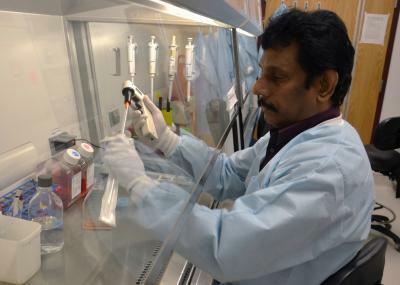 "Although the virus can potentially treat many different types of cancer, we are focusing on these five," Subbiah said.